Next article: What's On July–September Out Now! In Fremantle Arts Centre’s exhibition I WAS HERE the world is flipped upside down, long held beliefs are disproved and fact replaces fiction as seven artists grapple with what’s real, imagined or forgotten over time. Comprising photographic and sculptural works, I WAS HERE is a fascinating commentary on history itself and our relationship to the past. Robyn Stacey (NSW) invites you into the homes of Australia’s most acclaimed artists in her gravity defying photographic series. Using a camera obscura, Stacey projects gorgeously coloured images of the outdoors into artists’ studios. This ancient optical phenomenon uses a pinhole to project an upside down image into a darkened box or room. Historic icons are distorted in these shadowy, inverted rooms where fleeting moments of the present pass into history. 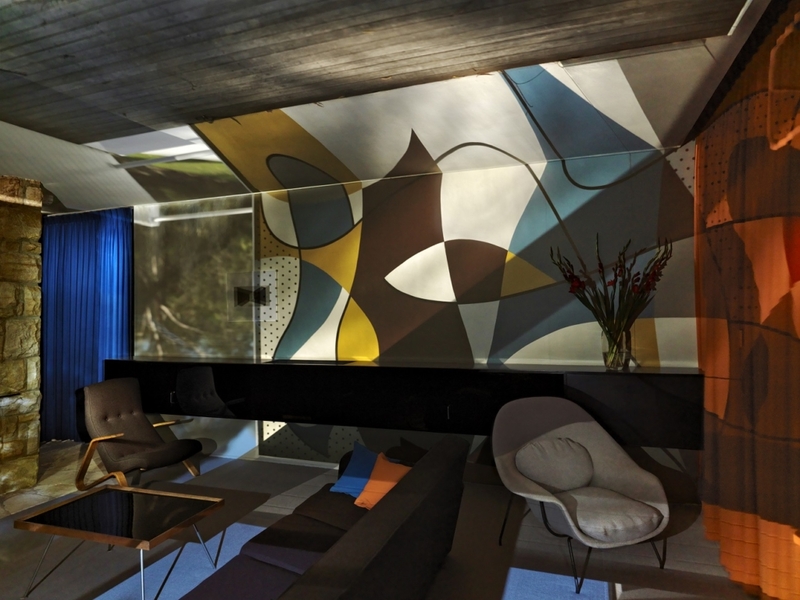 Stacey inserts the Rose Seidler House’s benchmark modernist mural inside the iconic home – once the most talked about house in Sydney; visits Geoff Kleem’s Parramatta studio; and captures Wendy and Brett Whiteley’s stunning house in Lavender Bay. Emerging artist Tom Buckland (ACT) presents a constellation of peepholes, each hiding its own handmade mini-universe. Built to an impossible scale, these kitsch cardboard scenes are filled with plastic people and sinister machinery. Each imagined world plays out a myriad of dystopic futures. The free-standing universes speak to both the making of history and its machinations with audiences able to peek behind the viewing wall, revealing the artist’s surreal illusions. Artists Alex Seton (NSW) and Amy Spiers (VIC) investigate how history is made and the ways in which false narratives become gospel. Examining stories of vanishing, Spiers’ campaign against whitewashing challenges the myths surrounding Hanging Rock. Immortalised by Joan Lindsay’s famous Australian novel Picnic at Hanging Rock and the 1975 film adaptation, Spiers looks at how these fictional legends are robbing Hanging Rock of its true Indigenous history. Alex Seton (NSW) disproves the existence of an island, presenting scientific evidence of its non-existence. Sandy Island, once thought to lie east of Australia in the Coral Sea, was first ‘discovered’ in 1876 and remained on various maps for over a century despite repeatedly being undiscovered across the ensuring decades. Shown alongside Seton’s marble sculptures, the artist plays with the transient nature of history as he undermines and unmaps landmarks and once-permanent monuments. History repeats in Kate McMillan’s (UK) haunting photographic series Lost. In this modern version of the Pompeii legend, McMillan takes us to The Buried Village located on the shore of Lake Tarawera, New Zealand. In the late 19th century the site was obliterated by a devastating volcanic eruption and the surrounding villages buried. While McMillan reflects on lost lives and fleeting histories, Wanda Gillespie (NZ) abandons the concept entirely. Gillespie amalgamates mythologies to create exquisite handcrafted objects which bear all the hallmarks of cultural artefacts but are in fact completely made up. Imagining societies that could have existed, her works are without history. For Kokatha and Nukunu artist Yhonnie Scarce (SA) the scars of colonialism remain. In Florey and Fanny, Scarce depicts the stories of her grandmother and great-grandmother who worked in the domestic service industry during the late 1800s and mid-1900s. 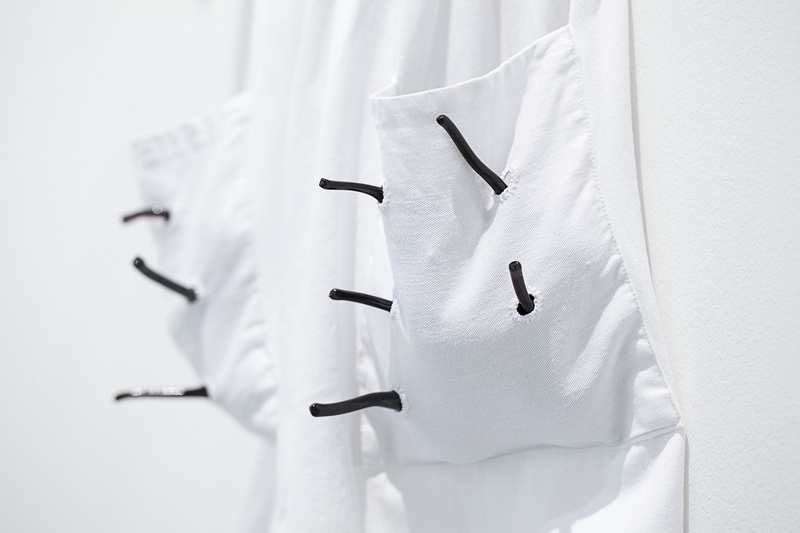 Scarce’s traditional white aprons point to the life of servitude experienced by the matriarchs of her family. Each apron pocket holds hand-blown glass yams. This traditional bush food punches through the fabric, demonstrating the strength of the women’s cultural heritage and the legacies that they have fought to keep. “The works in I WAS HERE are inextricably linked by the political nature of reporting and recording history, and in their shared material sensibility. The works are sculptural or photographic. They represent and create but not in the ways typically imagined,” said curator Anna Louise Richardson (WA). Filled with surreal landscapes, lost villages and buried lives, all is not necessarily what it seems in I WAS HERE.